Thinking of taking a UX course? It’s a smart move. In today’s fast-paced and high-choice digital world, websites and apps must be a breeze to use or customers will move on. Businesses are realising UX should be applied to every aspect of a web project, from written content and aesthetics through to development. So whether you’re a designer, developer or marketer it pays to expand your UX knowledge. 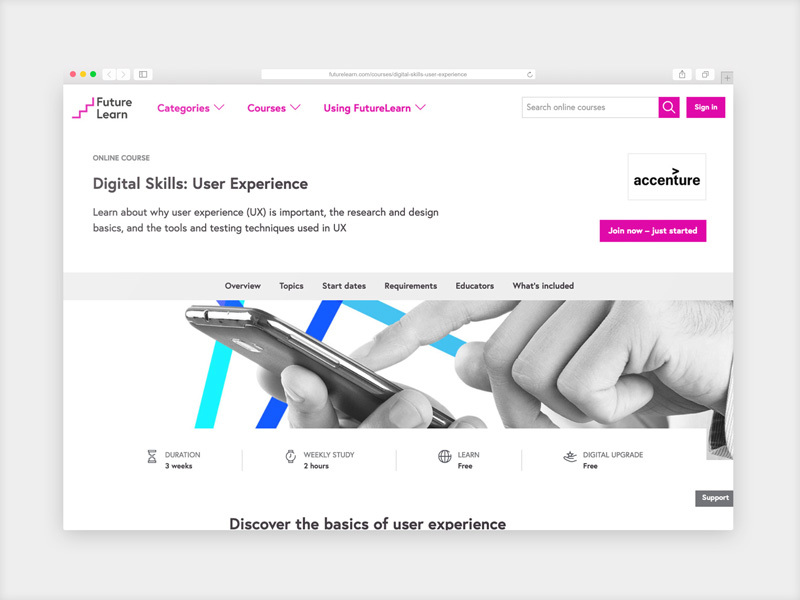 Alongside the rising demand for UX, there’s now an array of courses, all claiming to have the best tutors, give you the most important skills and the best prospects. With so many people jumping on the UX bandwagon, it’s hard to know which course will give you the edge. To help you choose, I’ve outlined some of the top UX courses available. I’ve listed a range of user experience design courses for every level, from beginner online courses, intermediate courses for a deeper dive into the subject, and finally university level. Whatever your goals and experience, there’s something on this list for you. If you’re a marketer looking to boost campaigns or an entrepreneur improving your website, UX design online courses are a fast and budget friendly way to get to grips with the basics. Here’s my pick of the best MOOCs and short courses you can take without any prior experience in UX design. If you’re a complete beginner this course is an excellent intro to the basics. You’ll learn examples of good and bad UX, research and testing techniques and other key principles. Alongside videos there are quizzes and assessments to keep you on track. Because it won’t cost you a penny, this course is a great option if you’re a small business owner or entrepreneur looking to improve your website on a budget. This course isn’t completely flexible; there’s set start dates for each module. But, you only need to commit to two hours of study a week, so it won’t take a big bite out of your schedule. Duration: 3 weeks, based on 2 hours of study a week. Cost: Free, with the option to pay for a shareable certificate. Always running out of time to complete an online course? Skillshare is the platform for you. Members can choose from a big library of video courses and earn money by teaching on the platform. 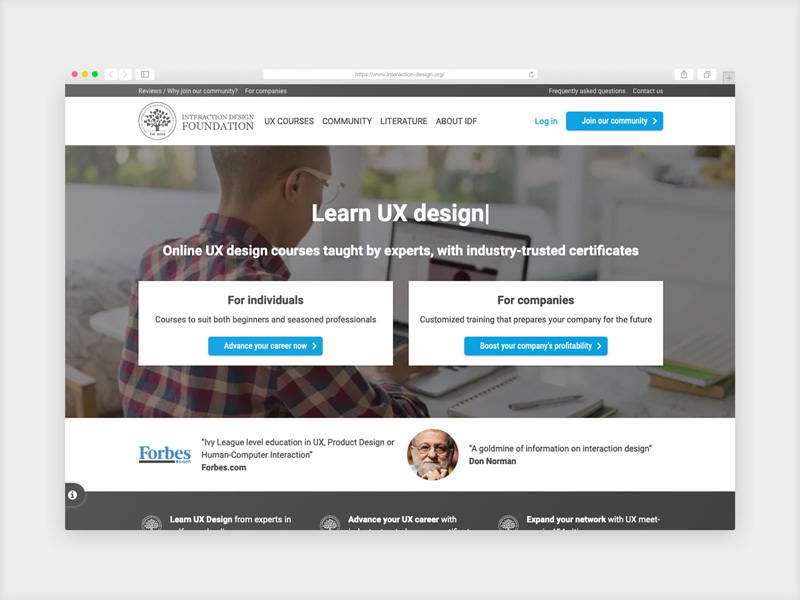 There’s a big selection of UX courses at beginner level and beyond. But the beauty of Skillshare is the courses are self-paced and made up of bite-size videos from just 5 minutes long. Keep in mind the quality of courses can vary as the tutorials can be taught by anyone. But there’s some real gems in the mix from noted designers. Skillshare is a great place to find unique tips and insights beyond the ‘textbook standard’ advice you see on more established courses. Cost: A free plan gives you limited access to the library. Or pay £7 a month for the full selection of courses. Coursera offers accessible courses from top universities, all at low cost or even for free. 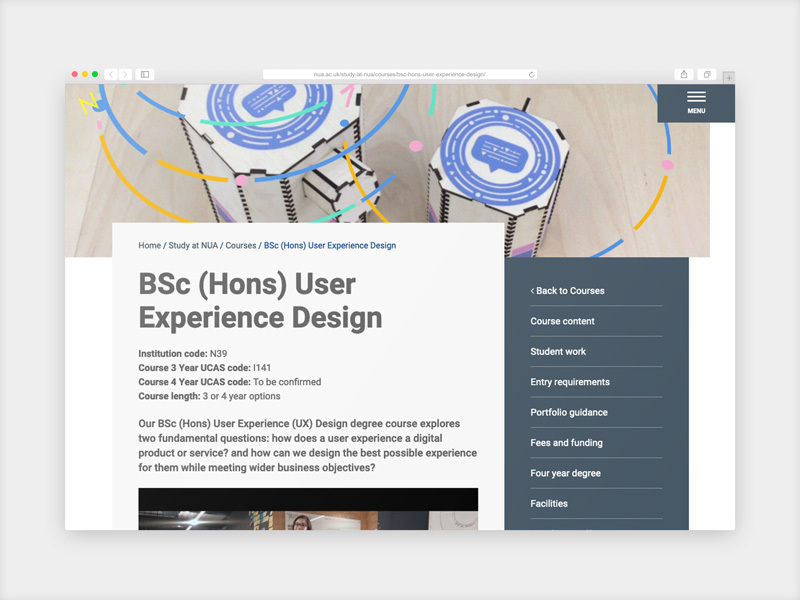 There’s a huge range of courses on UX including several for beginners. So it’s a great choice for quality learning on a tight budget. For a complete overview of the basics try the Interaction Design Specialisation, a collection of 8 courses. Start with Human-Centred Design, then move on to topics like Research and Prototyping and Design Principles. Each course has videos, quizzes and graded assessments to make everything stick. Because Coursera’s one of the most respected MOOCs out there, the certificates look good on your CV too. These courses aren’t self-paced; there’s set start dates and deadlines. But you only need to commit to 3 hours a week. Duration: 1 to 2 months per course, based on 3 hours of study a week. Cost: £26 each or £187 together. Or free, if you forgo the certificates and certain benefits. Lynda’s a popular learning platform for professionals, with over 4000 courses in business, tech and creative skills taught by industry experts. You can learn in your own time, and courses aren’t too long, packing in the essentials without any waffle. 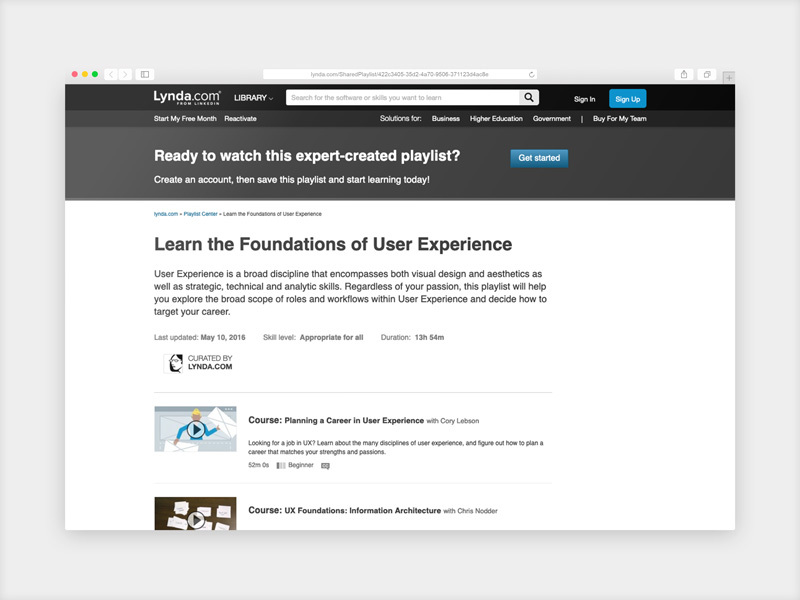 Lynda has a great range of courses on UX, covering almost every aspect you can think of. The UX Foundations series is a handy intro to topics like accessibility and usability testing, and for marketers there’s UX Foundations: Content Strategy. This course is ideal if you’re looking to increase conversions and customer loyalty with UX focussed content. Duration: Self-paced; each course lasts around 1-2 hours. Cost: Paid, but there’s a free trial for 30 days. Next up, a selection of the best intermediate UX courses. 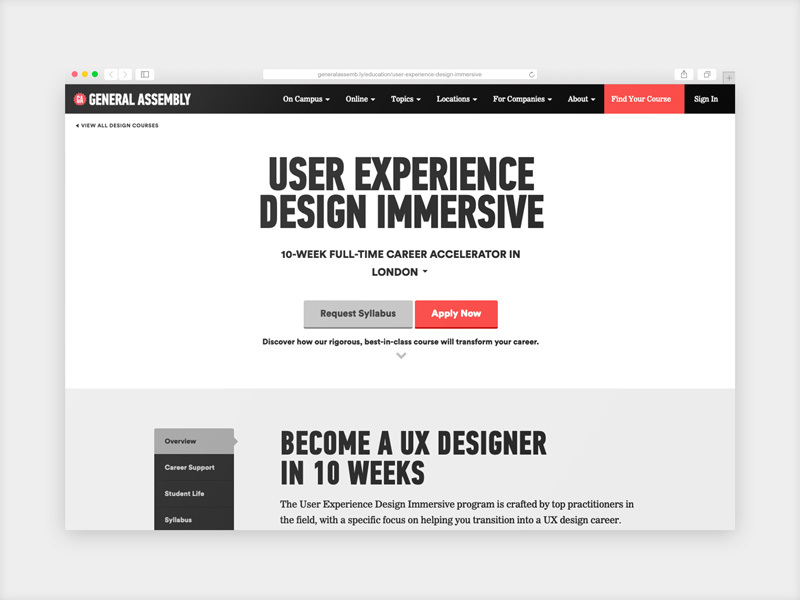 These are ideal if you’re a designer or developer looking to expand your current skills and move into the UX field. I’ve also included courses that turn newbies into UX professionals. This Scandinavian non-profit aims to make design education accessible and affordable. The IDF is attracting a lot of buzz in the design industry for the quality of its courses – even the founder of UX Don Norman is an advocate. Self-paced to fit around work commitments, there’s around 30 courses to sink your teeth into, ranging from beginner to advanced. The courses cover every aspect of UX, from user psychology to design methods. Alongside videos members can access an extensive library of textbooks, join professional forums and gain practical skills on real-life projects. Because IDF certificates are industry respected, these courses are a great budget option if you’re a busy graphic designer looking to transition into the UX field. But be warned: courses are so popular they get filled up fast. Cost: Annual membership for access to all courses is £72. Springboard’s UX Design Course is a great option if you’re new to UX but want to go professional on a fast track. It aims to take a beginner to employment-ready in just 3-4 months. The course packs a lot in. There’s over 131 hours of content including case studies and practical work on your own capstone project. You’ll cover UX skills like user research, design for mobile and prototyping. A key benefit is access to a UX mentor who will guide you through the process. Because course fees are charged monthly, there’s the incentive to finish faster and pay less. You might find this motivating or overwhelming, depending on how much time you can dedicate to the course. Duration: Typically completed in 3-4 months. The School of UX delivers career advancing bootcamps in London that last from just 1 to 5 days. Yes, you read that right. Taught by professionals in the industry, there’s a range of courses across the UX spectrum, including prototyping, wireframing and UI design. The school offers courses for beginners, but also ones tailored to people with experience in the industry. If you thrive in an intensive learning environment or you’ve a packed schedule this could be the place for you. The School of UX also runs a mentoring scheme with an experienced UX pro. While the course fees are very reasonable, mentoring is less so at £129 an hour. Cost: Courses are £149 – £699. Mentoring from £129 an hour. This 10-week career advancing immersive in London (and locations worldwide) features big industry names as tutors. The syllabus covers all the essentials like prototyping, testing, teamwork and collaboration, but you’ll also get your hands dirty working on real design projects. At a whopping £9,000 this course is by no means a budget option. But because it goes into a lot of depth it’s ideal for designers and engineers looking for solid UX training without the time commitment of academic study. And the GA’s career support is a big plus; there’s employer meet and greets and networking opportunities. Duration: 10 weeks full time. Courses at degree level and above ensure there are no gaps in your knowledge and make you indispensable to employers. Here’s my pick of the most respected academic UX courses. With a reputation for gold-standard teaching, the NUA is a great choice if you’re an FE student looking to progress into UX. The course focusses on combining technical computing and design skills with a firm knowledge of psychology to prepare you for a UX designer role. There are also industry placement opportunities to put your skills into practice. Entry requirements are currently A levels at grade BBB or above with at least one in Design, but the NUA will consider alternative relevant qualifications. Entry requirements: A levels BBB or above; or other relevant qualifications. Cost: UK/EU students £9,250 per year; international students £14,500 per year. If you want the best education in UX design at degree level, look no further than the mighty UAL. It’s one of the world’s leading specialist creative universities, ranked 2nd in the world for Art and Design according to 2019 QS World University Rankings. The course teaches the theory of UX and its practical applications with a mix of lectures, workshops and tutorials. Not only will you learn coding, animation and information design skills, you’ll venture into UX for emerging tech like wearables and VR. And if you have the talent you could be selected for an extra year’s internship in the design profession as part of the course. On the face of it, entry requirements aren’t too strict. The UAL also accepts mature students with experience in the design industry. But, there’s bound to be fierce competition for a course of this calibre. Entry requirements: A level or equivalent in an Art and Design field, and/or relevant professional experience in the industry. Cost: £9,250 per year; international students, £19,930 per year. Loughborough’s an internationally respected university known for the quality of its digital and design courses. This course builds on existing skills in both the creative and analytical aspects of UX design. You’ll work on a diverse range of projects, attend lectures and complete practical assessments. There’s the option to study part-time, ideal if you’re a graduate designer looking to further your career and keep working as you do it. The bar’s set high for entry, though. Currently you need a 2:1 or above in Design or a related discipline. Duration: 1 year full time, or 4 years part time. Entry requirements: 2:1 or above Batchelor’s degree in Design or a related discipline. Cost: £8,950; International students: £18,250. 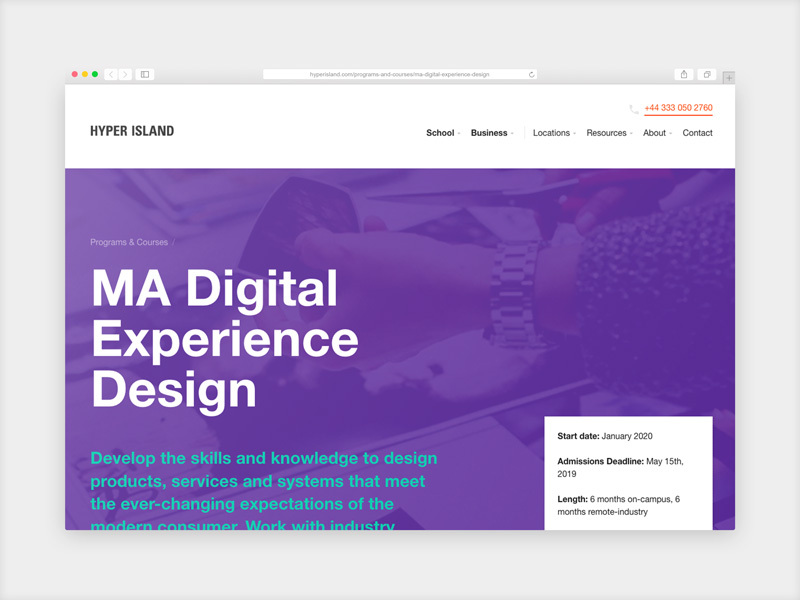 Hyper island is a digital business school with campuses in several cities across the globe. Specialising in real-world training, their MA is certainly geared towards employment: after 6 months on campus there’s 6 months practical work through industry placement. It’s a great option if you’re a design graduate or industry professional looking for a strong UX foundation with a practical edge. There’s no part time option here, so you need to go all-in and devote a year of your time. And it’s pricey, given you won’t have much free time to work while you study. But the course equips you with a good balance of analytical and creative skills to prepare you for a UX designer role. Entry requirements: A bachelor’s degree, or 3-5 years of relevant work experience. Cost: £14,000 or £17,000 for non-UK residents. So that’s my round-up of the best UX courses out there. Whether you want to improve your website, boost campaign conversions or enjoy the salary of a UX pro, these courses can propel you to new levels of success in the industry.